Taming of the stew | Fork off, heart disease! So I took up the challenge: to make a vegan stew that was plenty hearty but also had a lot of depth of flavour. I drew my inspiration from two sources. One being the fabulous Isa Chandra Moskowitz and her porcini beef stew. The other being this random recipe given to me by my Mother-in-Law, which rocked my taste buds. So I did a little recipe mash-up and came up with this ditty. The trick is to use fruit. In this case, dried prunes. It gives the stew that extra dimension. The cumin, curry powder and coconut milk also give additional complexities to the mix. 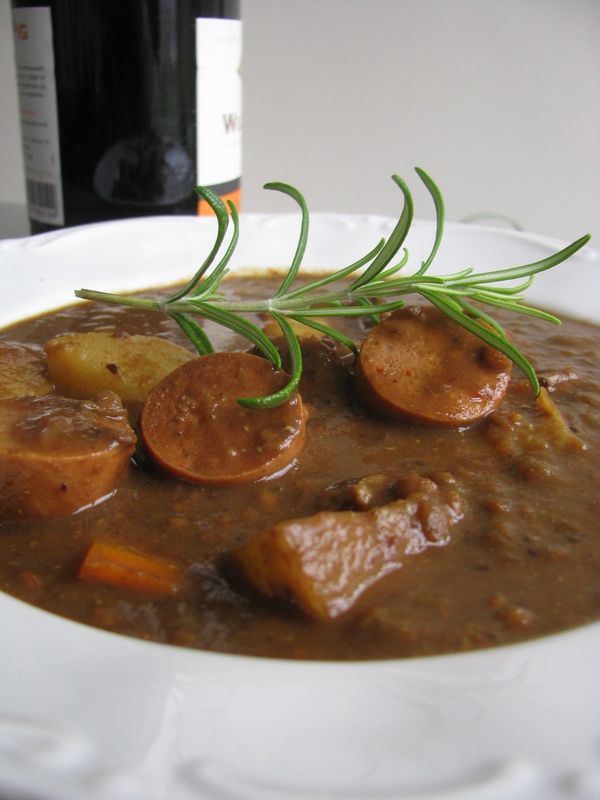 This stew would go down seriously well with Isa´s kalamata olive biscuits. In a stock pot, spray a bit of vegetable oil at the bottom so that the sausage pieces do not stick. Sauté for a few minutes under low-medium heat until they start browning. Remove from heat and set aside on a plate. Add the chopped onions and garlic and gently sauté until the onions start caramelising. Throw in the first 500 ml water, bouillon cubes, bay leaf, porcini mushrooms, chopped veggies. Let it simmer for about 15 minutes (or until the potatoes and carrots are soft). In the meantime, tip in the prunes and the other 500 ml water in a blender. Blend until you get a puree (it doesn´t need to be perfectly pureed). When the potatoes and carrots are tender, tip in the lentils, spices, wine, prune puree and coconut milk. Toss in the veggie sausages. Heat through. Serve with freshly cracked pepper and some biscuits to mop up the gravy. Yum! This looks amazing….I am going to try this immediately!